Who can book an Interpreter? The Deaf client or healthcare provider can book an interpreter. In consultation with Deaf clients, NABS will make all reasonable efforts to provide an interpreter based on particular needs, local availability and cost. 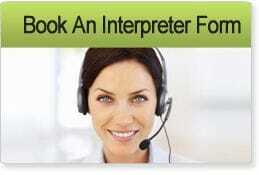 NABS only employs NAATI qualified interpreters. NABS interpreters will have some experience interpreting in health care situations. What can you do If NABS can't book an Interpreter? In some situations, Video Remote Interpreting may be an option if NABS is unable to book an interpreter to attend on site (click here for more information). What do you do if you or your Health Care provider cancels or changes your appointment? Tell NABS immediately and NABS will make sure you, the interpreter and the Health Care provider know about the cancellation or change. It is important to let NABS know of any changes to appointment or cancellation.